Although never elected to office, Esfandiar Rahim Mashaei has become a major political figure as chief of staff to President Mahmoud Ahmadinejad. He is also one of Iran’s most controversial politicians. Ahmadinejad appointed him vice-president in 2009, but the political backlash and opposition from Iran’s supreme leader forced him to resign within days. In May 2013, Mashaei was one of more than 500 candidates who registered to run for the presidency. He is widely viewed as Ahmadinejad’s political heir—and an attempt to keep the faction in power. The two men are also related by marriage. In 2008, Mashaei’s daughter married Ahmadinejad’s oldest son. Kourosh Rahamkhani profiles Mashaei. Does Mashaei have a base of support among the general population? Mashaei shares several characteristics with a new generation of political elites. Most were born in villages and small towns. They were young during the 1979 revolution. They have not emerged from the traditional conservative establishment. Many have backgrounds in the Revolutionary Guards or security forces, fostering a “military-security” political class. Finally, few have so far held elected office. But it is difficult to assess how much appeal Mashaei has among the general population. Some of the president’s allies are concerned that Mashaei’s rhetoric has the potential to become popular. How is Mashaei perceived among Iran’s political elite? Mashaei’s statements have provoked the clerical establishment in the holy city of Qom as well as traditional conservatives in the regime. In 2007, Mashaei—then the vice president and head of the Cultural Heritage Organization—angered top clerics and politicians by attending an event in Turkey where women performed a traditional dance. In 2008, he hosted a ceremony in which some women played tambourines and others carried Korans. “It is people who do not understand music who say it is haram [forbidden by Islamic law],” he said. His daring comments and actions have pushed the envelope of the Islamic Republic’s officially sanctioned values. Many clerics consider his remarks on religious affairs to be encroaching on their territory and dismissing them as uninformed or even heretical. Even fervent supporters of Ahmadinejad have criticized Mashaei. Hardline cleric Ayatollah Mohammad-Taqi Mesbah-Yazdi branded Mashaei’s statements “erroneous and inappropriate.” In 2009, the supreme leader’s representative on the hardline newspaper Keyhan accused Mashaei of being an agent of the “velvet revolution.” General Hassan Firouzabadi, head of the Joint Chiefs of Staff, denounced Mashaei’s remarks as a “deviation” that undermined national security and against the principles of the Islamic Republic. Esfandiar Rahim Mashaei was born in 1960 in a northern Iranian village. He participated in his town’s revolutionary rallies as an 18-year-old and studied electrical engineering at Isfahan University after the revolution. In 1981, Mashaei joined the Revolutionary Guards intelligence unit after the Mujahedeen-e Khalq instigated an armed campaign against the Iranian government during the Iran-Iraq War. He was later dispatched to Kurdistan, where Kurdish militants were battling forces loyal to the newly formed Islamic Republic. Mashaei championed a cultural-propaganda campaign, rather than a purely coercive counterinsurgency, to deal with the Kurds. In 1984, Mashaei joined the Intelligence Ministry in Kurdistan, where he met Mahmoud Ahmadinejad, then governor of the northwestern city of Khoy. The two men developed a close friendship that has endured almost three decades. In 1986, Mashaei was appointed director of an Intelligence Ministry department that dealt with ethnic issues in sensitive regions. He left Kurdistan to help formulate a national strategy. In 1993, he became head of the Interior Ministry’s Social Affairs Department under President Akbar Hashemi Rafsanjani. After the 1997 victory of reformist President Mohammad Khatami, Mashaei left the Interior Ministry and worked for state radio, which is under the direct control of the supreme leader. In 2003, Mashaei joined the staff of Tehran’s new mayor, Mahmoud Ahmadinejad, after he was selected by the conservative municipal council. He headed the city’s cultural-artistic affairs organization. Among his controversial initiatives, Mashaei proposed building a major thoroughfare to prepare for the arrival of the twelfth Shiite Imam—the Mahdi or “Hidden Imam”—who disappeared in the ninth century. The Mahdi will return as a messiah as the world comes to an end, according to Shiite eschatology. After Ahmadinejad was elected president in 2005, Mashaei became a major player in his cabinet, serving as the president’s chief of staff. They also now have family ties. In 2008, Mashaei’s daughter married Ahmadinejad’s oldest son. What role has Mashaei played in Iranian politics? Under Ahmadinejad’s patronage, Mashaei has gained more influence in the cabinet, and many see him as the president’s second-in-command. But since 2005, he has also emerged as one of the most controversial figures in the Iranian government. He has been at the center of internal battles between Ahmadinejad’s circle and conservatives known as principlists, who feel the president is veering from the revolution’s early principles. Mashaei has held other key positions on both domestic and foreign affairs. Besides chief of staff, he has been the president’s adviser for Middle Eastern affairs; vice president of the High Council of Iranian Affairs Abroad; and the secretary of the administration’s cultural committee. Mashaei is often blamed for formulating apocalyptic and religious-nationalistic themes prominent in Ahmadinejad’s rhetoric. Ahmadinejad has urged Iranians to actively pave the way for the coming of the Mahdi. The two themes have been widely viewed as an attempt to build a new constituency among the young and the poor. Ahmadinejad’s messianic interpretation differs from popular Shiite mythology and diminishes the role of Shiite clerics. As clerics are falling out of favor in Iranian politics, Ahmadinejad’s opponents are concerned that his rhetoric of “principlists minus the clergy” will become more popular and enhance hardliners around the president. President Ahmadinejad appointed Mashaei vice president in 2009, but he lasted only one week. What happened, and why the controversy? President Ahmadinejad appointed Mashaei as his first vice president on July 17, 2009 after the disputed June presidential election. The appointment angered many top clerics and other allies of Ahmadinejad. The appointment reportedly increased tensions within the administration. At one cabinet meeting, four ministers clashed with the president over Mashaei’s appointment. 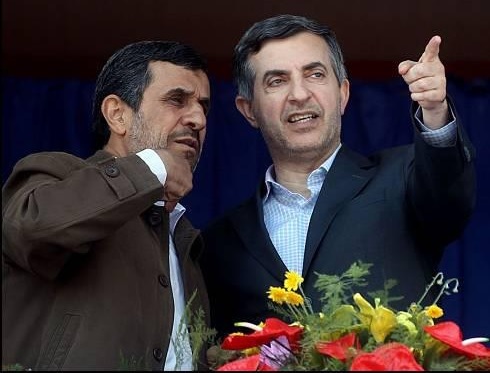 On July 24, Supreme Leader Ayatollah Ali Khamenei overruled Ahamdinejad’s appointment and Mashaei was forced to resign. The Iranian constitution states that the first vice president has the duty to lead cabinet meetings in the absence of the president. He also succeeds the president—with approval of the supreme leader—if the president dies or becomes incapable of performing his duties. Ahmadinejad’s critics suggested that the president was manipulating the post-election turmoil to insert his right-hand man into the center of power. In the end, however, Mashaei’s opponents had enough leverage to block his appointment. Ahmadinejad instead appointed Mashaei his chief of staff. What is Mashaei’s relationship with Ahmadinejad, and why is the president so supportive of him? Mashaei has been viewed as a man surrounded by controversy, and his relationship with President Ahmadinejad has been an enigma to the president’s conservative allies. Ahmadinejad once said he had “a thousand reasons” to support Mashaei and that there was “no convincing” reason for the attacks on him. “One of the virtues and glories God has bestowed on me in life was to become acquainted with this great, honest, and pious man,” Adhmadinejad said. What positions has Mashaei taken on Iran’s most critical domestic and foreign policy issues, such as negotiations over the nuclear program? Mashaei generally echoes the president’s views on Iran’s nuclear program. There is no sign of disagreement between them. But both men have distanced themselves from core fundamentalist policies in Iran, including the hejab (Islamic dress) and police crackdowns on styles of dress considered un-Islamic. Kourosh Rahimkhani is an independent scholar specializing in Iranian affairs. He worked as a journalist for a number of reformist newspapers in Iran before moving to the United States.